Official start of Lughuru Bible Translation Project in partnership with WW (Word for the World) and UBS (United Bible Society) and BMT (Baptist Mission to Tanzania). WW providing daily oversight, PBT offices and logistical support, UBS to Consultant Check and publish finished work, BMT providing missionary as part-time exegete. A Chronological Bible Storying booklet completed and the book of Luke ready to be consultant checked in preparation for Jesus Film Project. Lughuru dictionary workshop was held in July. We are working with our WW partners to raise funds for a matching grant that they have secured to start five additional new translation projects in Tanzania within the next year; these will primarily be in the Morogoro Cluster. Brad coordinated the first joint ICTP (Introductory Course in Translation Principles) held in Morogoro during the month of August. This partnership with Wycliffe/SIL, UBS, and WW in training national translators came about through our national Forum of Bible Agencies. Tammie taught Anthropology to second year students in the WW 4 year training program for translators. There were approximately 75 students total in the two years of classes. 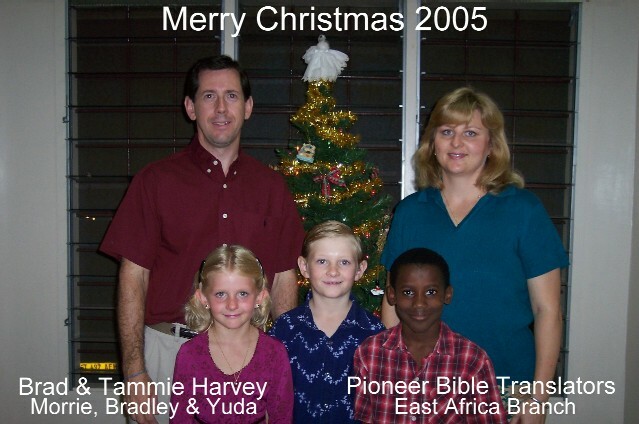 Brad traveled to Thailand to attend the International Language Assessor's Conference (ILAC) held every four years and the whole family attended the All Africa Mission Conference in Kenya. We coordinated a partnership with Team Expansion and Scripture Mission in translating and editing 10 booklets from the Intervarsity Press Bible Study series into Swahili. Five of the Bible studies have now been published so we have moved into the area of distribution. Additions and Renovations were sufficiently completed on one of the PBT houses to allow us to occupy the house as a parsonage, though refinishing and repairs continue. Extensive communication and processing of paperwork was completed for numerous new & returning personnel: Chris & Nicki Chamber, Naomi Dobbins, Reuben & Doreen Kabwe and family (WW), Tuck DuMond, Grant Testut, Norm & Jill Weatherhead and family, and Stephen & Jocelyn Hill and family (delayed), as well as for departing personnel: Jeff & Lori Hobbie and family, Jeri Ashley, Tuck DuMond, Naomi Dobbins, and Melissa Smart. Next August, we look forward to hosting the second annual, joint (PBT/SIL/UBS/WW) ICTP course in Morogoro in August again; Brad will again be responsible for organizing the event. Simultaneously, the second/third year of the WW/PBT 4-year program will be run as well. We look forward to hosting between 75-100 students in these August courses! New personnel, arriving at just the God-appointed time, along with the tremendous response and support from the Morogoro Regional churches, and funding through our WW partners are all being orchestrated to finally make the full start of the Morogoro Cluster project a reality within the next year with the start of five additional translation projects. Property improvements also need to move ahead to keep up with demands for offices, classroom and a dormitory for new personnel, new translation projects and the continued training. The remaining repairs and improvements will be completed on our parsonage. Home Assignment (Furlough) is scheduled to begin in September for 10 months; this will be after a 5 ½ year term on the field. As previously mentioned, office space is becoming a serious issue. Funding for property improvements as well as just general EAB operations. Adequate office equipment (especially computers) and furniture for national partners, especially for the new translation teams. Coordination of the partnerships required to accomplish the cluster approach to translation and training, as well as helping new personnel get settled and orientated to life in Africa. Furlough Preparations in the midst of welcoming new personnel, beginning 5 new translation projects, running the joint ICTP course, and completing house improvements. We are extremely happy to be living in more of a long-term housing situation, even though many of the improvements haven't quite been completed. We have finally gotten a diagnosis for Yuda of RAD (Reactive Attachment Disorder). This has been a very painful process for our family in more ways than one. PBT sent a specialist out in October to make an evaluation and help us retool for better facing the challenges of addressing the RAD. Having an accurate diagnosis has alleviated some of the frustration by bringing a clearer understanding of the challenges and a more concrete plan of action. Yuda is doing better since returning to home schooling, but getting settled back into home schooling with a new teacher was extremely challenging. We'll be starting the US paperwork process in January in order to complete Yuda's US citizenship process during our home assignment. Preparing all our kids for home assignment will be important since, other than a 5-week holiday visit two years ago, Bradley was just turning 6 and Morrie just turning 2 when we last left the States. They will be 11 and 7 and this will be Yuda's first experience of the US other than that holiday visit. We will also be homeschooling all three kids as we travel around the US in a travel trailer, but plan to take advantage of the situation for great school field trips as they learn US history. There are exciting developments on the horizon and that is what keeps us going and pushing forward in spite of the fact that we are extremely tired and emotionally drained from being well overdue for home assignment and from dealing with Yuda's attachment disorder and related circumstances. But we are hanging in there, encouraged by all that God is doing around us, in us and through us. We are endeavoring to enjoy this amazing ride and journey that the Lord has us on, rather than becoming overwhelmed with the daily details and struggles. Thank you for your partnership, love and encouragement in Bringing God's Word to Life for the Peoples of Tanzania!